All contact details of our manager you might need to reach them are in your Merchant Profile. To view these details or write to our Support Service, push Support button in the top right corner. You are working with is your personal manager. This manager hosts your company in Yandex.Checkout from the very moment of onboarding and knows best what to do. You can write and call this manager if you have any general and financial questions. Technical specialist—address for technical questions. For instance, you cannot figure out how to set something up, or something is not working. We recommend specifying identifiers in the message: contract number, application number, and shopId. In this case, our managers will immediately know which store is it about. 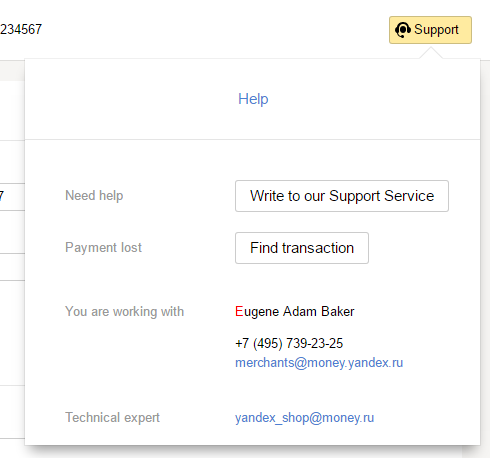 Owners and administrators of Merchant Profiles (except non-Russian residents) can write to our Support Service directly from their Merchant Profiles. Push Support button in the top right corner, then push Write to our Support Service. Tell us what happened. You can attach a file with details or screenshot to your message. We usually reply to such messages within a business day. If you are sure a payment went through, but you cannot find it in your Payment History or our Registers, contact our specialists: they will look into it. 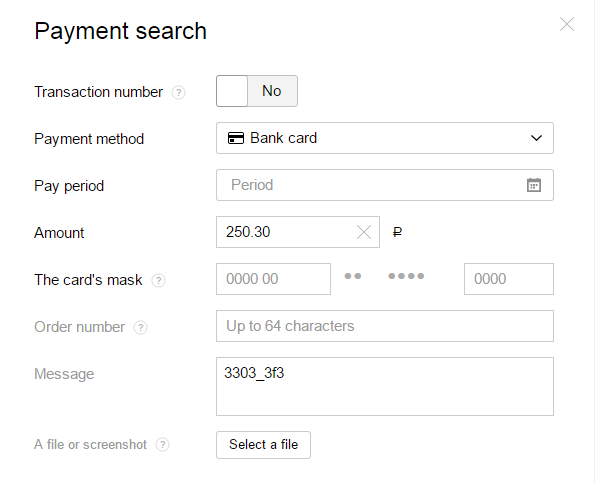 Searching for payments under your Merchant Profile is not working: if you missed something, write at poisk@yamoney.ru. Click the Support button in the top right corner. Push Find transaction. If you know the number of the transaction, it will be enough to specify it. If you do not know one, it will require additional information. Leave the toggle switcher near the field Transaction number as No. Select payment method. If the method you need is not in the list or you are not sure what to select, push Other method. Specify the timespan when the payment was made and the amount within the accuracy of kopecks. This is obligatory. 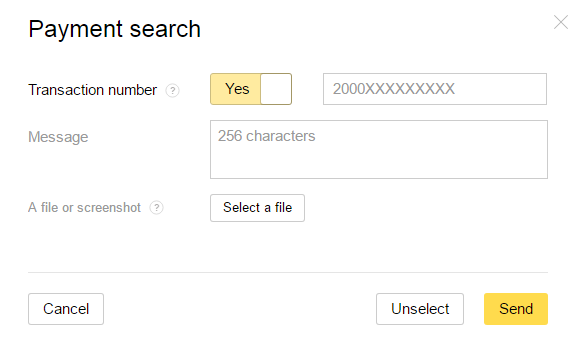 Fill out all additional fields if you know what to type in. Precise set of these fields vary depending on the payment method. You can attach files or screenshots to your message: your payment register, screenshot of the payment result or something else. Our specialists will get the request and write to you when the payment is found.